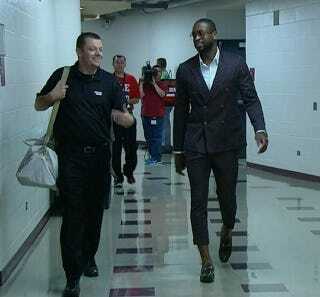 From time to time, Dwyane Wade wears clothes. I think tonight was one of those nights. Maybe. Bag Man: ....that's why you're D-Wade, though, man. Stylish. Wade: You don't think I look crazy? Bag Man: Heck no! See, now, me? I can't pull that off, man. Not a chance. But you've got moves, D-Wade. Moves I don't even know about. I can't even wear hats. Wade: I feel a little self-conscious, but I promised a friend. Bag Man: Dude. You got this. I'm tellin' ya. I'm just some frumpy bag guy, but you are a superstar. Look at Kanye; he wore a skirt, you know? And people love him. You could show up to the game wearing zubaz pants, but like M.C. Hammer-zubaz pants and someone, somewhere is going to think it's awesome. Bag Man: Nonono, I'm just saying you could dress like M.C. Hammer on drugs and people would still dig it. But you're not dressed like that now, [waving hands in giant circles around Wade] this whole thing is awesome. Wish I had the legs for it. Wade: You mean M.C. Hammer on more drugs. Bag Man: Ah! That's why you're D-Wade!